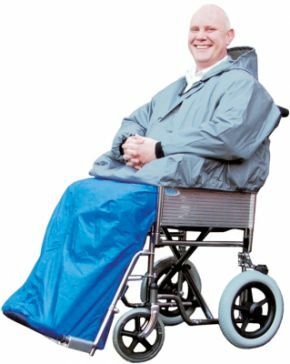 Wheelchair Kozze Kape With Sleeves One Size Fits all. The Kozze Kape with sleeves is available in a one size that fits everybody. It has been designed to provide upper body protection whilst using the Kozee Toze. The soft elasticated cuffs comfortably ensure that there is no chaffing on gentle skin, the neckline zip means it can be put on or taken off with ease and the snug fitting hood ensures top to toe protection. There is a security pouch on the front of the garment that can be used for those bits and pieces. It also cleverly doubles as a storage bag for the Kape with Sleeves, ensuring that it remains tidy until required. Available in one size and comes complete with hood.